Mormon-Evangelical dialogue is in the news. Neither the invitation nor the controversy are surprising in my view. Jerry Falwell Jr. is friends with Glenn Beck, a nationally known radio talk show host who is a Mormon. This indicates that Falwell is supportive of and involved in Mormon-Evangelical relationships and dialogue. On the other hand the negative reaction is also easy to understand as many Evangelicals continue to understand Mormonism as a cult, and that the best response comes by way of apologetic and boundary maintenance approaches. For over a decade Fuller Seminary president Richard Mouw has participated in Mormon-evangelical dialogue with a view to developing a better understanding between the two groups. His participation in these discussions has drawn severe criticism and even anger from people who believe such talks are pointless or even dangerous. This brief, highly accessible book is his answer. Advocating humility, patience, and a willingness to admit our own shortcomings, Mouw shows why it is necessary to move beyond stark denunciation to a dialogue that allows both parties to express differences and explore common ground. Without papering over significantly divergent perspectives on important issues like the role of prophecy, the nature of God, and the creeds, Mouw points to areas in which Mormon-evangelical dialogue evidences hope for the future. In so doing, he not only informs readers but also models respectful evangelical debate. 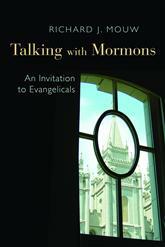 An interesting facet of this book is its attempt to commend dialogue with Mormons to an Evangelical audience. Although many segments of Evangelicalism seem more open to dialogue than in the past, this may prove to be a tough sell in other quarters as demonstrated by an article written by Peggy Fletcher Stack in The Salt Lake Tribune where Mouw's book was discussed. Reader comments accompanying the article are not encouraging. I am quoted in the piece, and several negative comments and allegations are made. Some readers may be interested in my views on a couple of areas where concerns were raised. One was in the area of how my approach at dialogue with Mormons can be "biblical." Please see Bob Robinson's essay where he discusses how dialogue can be both positive and non-compromising, which includes an appeal to the biblical basis for dialogue which supports my thoughts expressed in the article. The other area of concern was how one could move beyond the false prophet/true prophet dichotomy in relation to religious figures like Muhammed and Joseph Smith. In a previous blog post I set forth my ideas in this area by way of reflection on the proposals of others.